Karachi, 1994. Two words to send chills through all Australian cricket fans. This is Boonie being bowled by Mushtaq Ahmed for 19 (runs not cans) in the first innings. Australia was in complete command of the match. We seemingly couldn't lose. Meanwhile Pakistan's situation was hopeless. They were playing for pride rather than an impossible win. And then? They won. Somehow, they hauled their bedraggled body over the line. Amazing. No, this is not the script of the 2016 Test match at The Gabba in Brisbane, though scarily, it may yet be. We refer to the Karachi Test of 1994, a remarkable and very famous Test match which was then hailed as Pakistan's greatest ever victory. Test match no. 1268 was noteworthy for lots of reasons other than the result. Most famously, Pakistan added 57 for the last wicket, in a situation that was unbearably tense for spectators and players alike. Australia batted first and made 337. Michael Bevan top-scored with 82, in what seemed a portentous start to a fruitful Test career. Nope. He ended up without a century in 18 Tests, and remained known as a one-day specialist with an incredible average of 53. Pakistan replied with 256, the wickets shared evenly among Australia's bowlers. This particular appeal was unsuccessful, but Warney would eventually get his man (who is Pakistan all-rounder Wasim Akram). 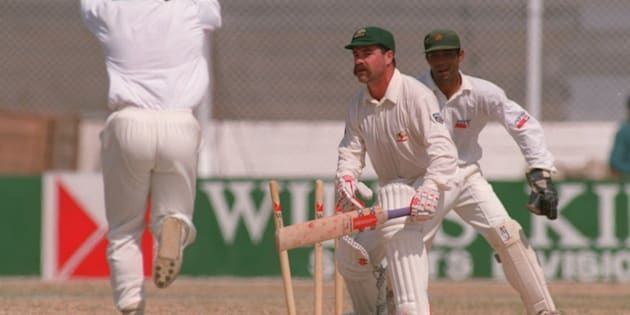 Australia made 232 in its second dig, thanks largely to David Boon's unbeaten 114 (that's runs, not cans). That left Pakistan needing 314 to win. It wasn't a huge score, but on a slow crumbling pitch, history suggested it just wouldn't happen. But Pakistan had a little history on its side too. It had never lost a Test match at its National Stadium, and was always going to fight. Australia's bowling had issues too. 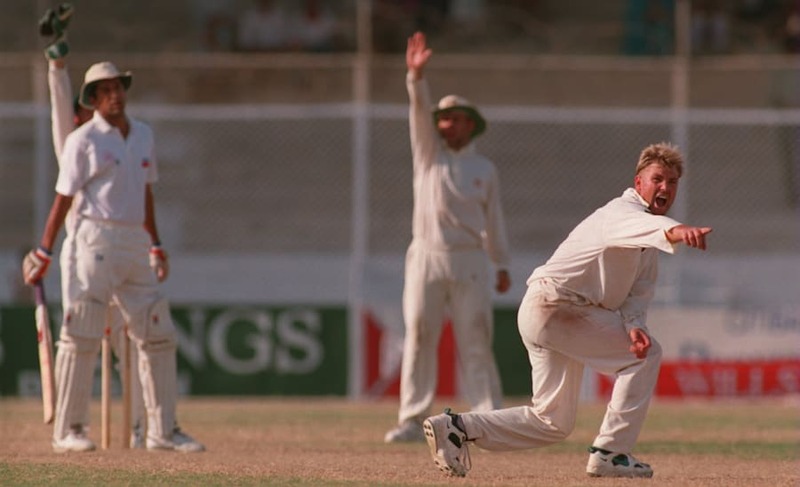 Glenn McGrath sustained a second innings injury, as did our second spinner Tim May. That left only Warne and Jo Angel, a West Australian paceman who played just four Tests in an unremarkable career. Warne, as you'd expect, shouldered the bulk of the bowling. Both Waugh twins also chipped in. It was Warne (who else?) who made the crucial middle order breakthroughs, as Pakistan plummeted from 4/174 to 7/184. It looked like game over from that point. But Inzamam-ul-Haq -- a portly figure not prone to moving quickly at the best of times -- was in a mood to hang around.. e found an unlikely ally in leg spinner Mushtaq Ahmed, who was perhaps better equipped than the full-time batsmen to counter his direct counterpart Shane Warne. Together, as the crowd chanted "God is Great" in Urdu, the duo saw Pakistan home. They did it in rapid time too, taking just 8.1 overs to amass those final 57 runs. The final act of the game? Four byes off a Warne delivery which went through Ian Healy's gloves. For the whole of Pakistan, much chaotic joy ensued. 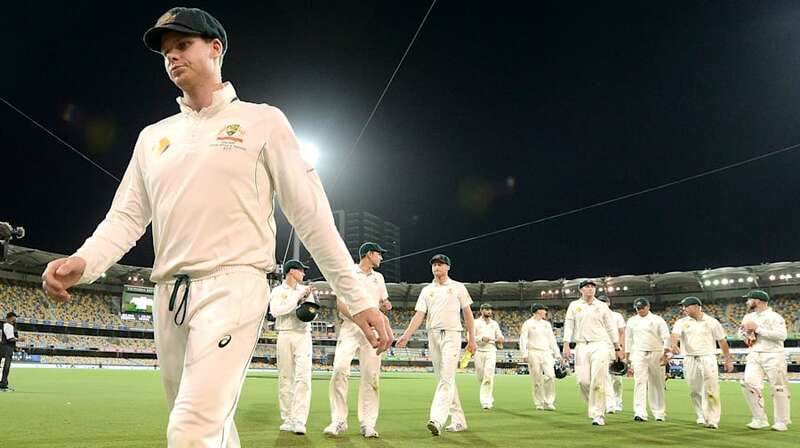 For Australia, the loss was heartbreaking, especially since it followed narrow losses to the West Indies at Adelaide in 1992-93 (one run) and South Africa at Sydney in 1993-94 (five runs). This was a strong Australian team which was winning overall, but it just couldn't seem to win a close encounter. Cut to 2016. Different era, different match, different Australian team. Steve Smith's declaration on Saturday night, setting Pakistan 490 to win, seemed a formality at the time. In a match we were dominating, it seemed unlikely Pakistan would pass 250. Worrying times ahead for Steve Smith. Yet here Pakistan are on day five, just 108 runs short of victory, and Australia's declaration suddenly seems a little arrogant. Pakistan has only got two wickets in hand, but who knows? If you're near the TV, it might pay to keep an ear closely attuned to Mark Taylor and Michael Slater. Both commentators were part of that 1994 Australian team. No Australians will be more nervous. Well, apart from the other 23 million of us. 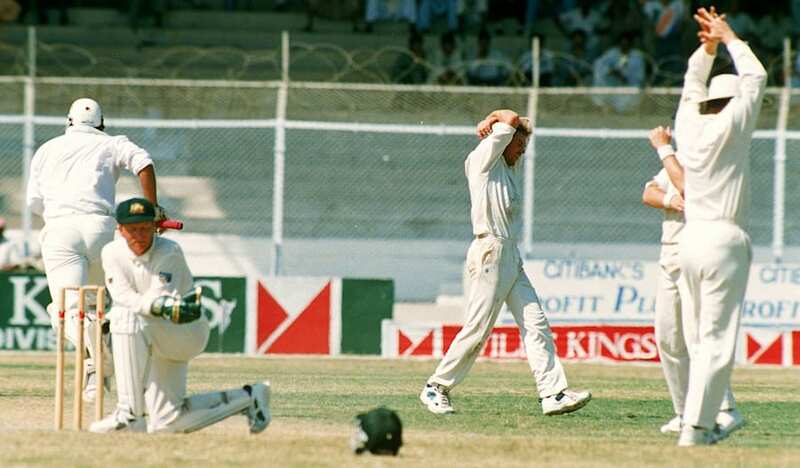 The Karachi 1994 Test scorecard is here.